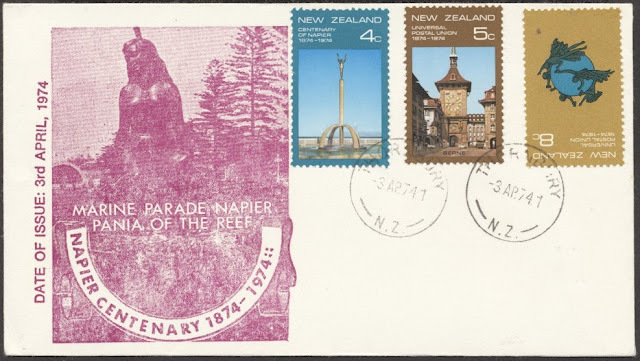 Virtual New Zealand Stamps: 1958 & 1998 - Pania of the Reef. For an index to all our posts on The Maori People. This post was inspired by something in the post Mary has just completed 1958 Anniversaries. In the Hawke's Bay Centennial issue is a stamp 2d - Pania of the Reef. This statue caught my interest as I remembered seeing it in the 1998 Town Icons issue too. (Both stamps are shown below). 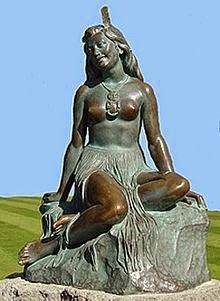 So in looking deeper I discovered the story of Pania of the Reef; a Maori legend or myth, a romantic yet tragic love-story, and a beautiful bronze statue. 1958 Hawke's Bay Centennial. 1998 Town Icons - Napier, NZ. above she take centre place as the main subject of the stamp. 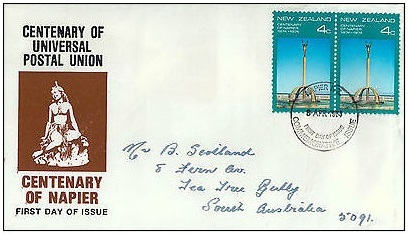 of the 1974 Centenary of Napier. New Zealand - 2004 Baypex´04. 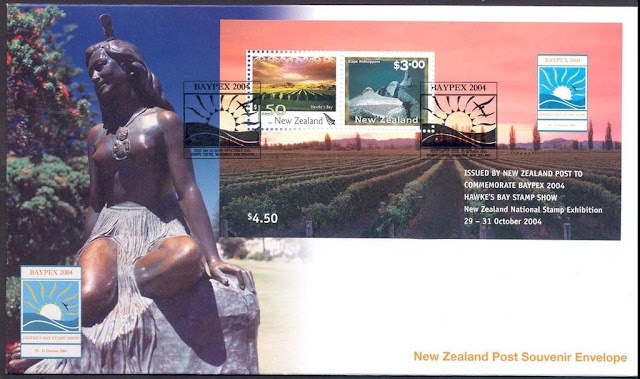 NZ Post released for the 2004 Baypex'04 Stamp Exhibition. $1.50 - 2004 Tourism - Hawke's Bay Vineyard. $3.00 - 2000 Pictorials - Cape Kidnappers. Blue Label designed for the Exhibition. 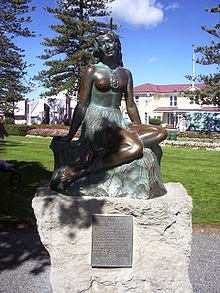 Pania of the Reef was a beautiful sea maiden who lived in the sea on the east coast of the North Island of New Zealand. By daylight she swam about with creatures of her reef world but after sunset would go to a stream that ran into the bay where the city of Napier now exists. She would travel up the stream to an area where she could rest among the flax bushes beside a spring of pure sweet water, enjoying the sounds and feelings of a different world above the ocean. Karitoki, the very handsome son of a Māori chief, quenched his thirst every evening at the stream near where Pania rested because it had the sweetest water. He was unaware she was observing him for many weeks until one night she whispered a faint spell. It carried on the wind to Karitoki who turned around to see Pania reveal herself to him as she emerged from her hiding place. Karitoki had never seen someone so beautiful and instantly fell in love. Pania fell in love also, and they pledged their lives to each other and were secretly married. Pania and Karitoki went to his whare (house), but because it was dark no-one saw them enter. At sunrise, Pania prepared to leave but Karitoki tried to stop her. She explained that as a creature of the ocean, when the sirens of the sea called her each morning, she could not survive if she did not go to them. She promised to return every evening and their marriage continued on that basis. After awhile Pania gave birth to a son who was completely without hair and so was named Maremare, ‘the hairless one.’ Like his mother, he was as much a creature of the sea, as of the land. With the birth of this child, Pania's husband became concerned that he might lose them both to the sea people. He hoped to find a way to keep his child and wife with him always, so he consulted a kaumatua (wise elder) in the village, who believed Karitoki as he knew ocean maidens did exist. The kaumatua told Karitoki that being a sea creature, Pania would not be allowed to return to the sea if she swallowed cooked food. That night, as Pania slept, Karitoki took a morsel of cooked food and put it in Pania's mouth. As he did so, Ruru the morepork (owl) called a loud warning and Pania was startled from her sleep. Horrified that Karitoki had put her life in jeopardy, Pania fled from the whare and ran to the sea. Her people rose to the surface and drew her down into the depths as Karitoki swam frantically about the ocean looking for her. Sadly, he never saw her again. When people now look deep into the water over the reef, some say they can see Pania with arms outstretched, appealing to her former lover. It is unknown whether she is imploring him to explain his treachery, or expressing her continuing love but unable to come to him. The sea off Napier is now protected by Moremore, the son of Pania and Karitoki. He is the kaitiaki (guardian) of the area, a taniwha (spirit) who often disguises himself as a shark, a stingray or an octopus. Karitoki intentions are not so good. Since his wife only came to him at night, no one would believe that she was real. He wanted to show her off, show her beauty to the people. That is why he placed cooked food in her mouth. Some stories say she died, others say she was prevented from ever returning to land. Either way, the out come was the same. he never saw his beloved Pania again. The stories seem to agree that child Moremore was turned into a shark but sometimes as an unpredictable shark (taniwha) which lived in the waters around the reef off Hukarere, and at Rangatira, the entrance to the inner harbour at the delta of the river called Ahuriri. Sometimes he would protect people but sometimes he wouldn't. When fishermen of today tell the legend of Pania, they claim that at ebb-tide she may be seen lying outstretched at the bottom of the rocky shelf, with her hair still as black as ever and her arms stretched shoreward. According to old Maori folk, however, she was turned into a fishing rock, from which various kinds of fish might be caught. Within the hollow of her left arm-pit only rawaru may be caught, and from her right arm-pit snapper alone, while her thighs yield only the hapuka. In the days of old, these fishing grounds were sacred, but today, being frequented by pakehas (Europeans), the place has become common to all and fish are no longer plentiful. Recently I talked with a friend of mine who teaches Maori language and culture. She agreed with me about variations of a story added richness and depth to its content but also pointed out two other important things we need to consider. First there is a purpose to all Maori stories. They were never just entrainment, rather were told to explain things the Maori people observed around them, both physical and spiritual, but which could not be explained. While not considered to be scientific by todays standards, these stories did achieve their purpose in that they explained things the people had no other way of understanding. Taken in this light, who can say that they were wrong? Secondly she told me there are lessons, morals to be found in these stories. In this case Karitoki should have expressed his concerns to Pania. In doing so, perhaps a better outcome could have been found, one that would not have cause him to harmed Pania. The statue of Pania of the Reef at night. The statue was commissioned by members of the Thirty Thousand Club after the Anglican Bishop of Aotearoa, Frederick Augustus Bennett, related the legend of Pania to them. Several students from Hukarere Girls College were photographed as models for the statue, and eventually, Mei (May) Irihapiti Robin (now Mei Whaitiri), was selected. A clay likeness of the photograph of Mei and an actual traditional Piupiu skirt were made by the Italian Marble Company of Carrara in Carrara, Italy. The clay model was then used to produce the bronze statue, which is estimated to weigh between 60 and 70 kg. Over the years Pania the statue has had an eventful life having been shot in the head, stolen and the victim of many silly pranks. But she is a tough girl, made of a purer bronze than the gun-metal used in many statues. She still sits there today looking out upon the people who visit her every day. But there is a far-away look in her eye. Perhaps she is still thinking of her beloved Karitoki. The statue has often been compared to the Little Mermaid statue in Copenhagen; there is a resemblance between the two figures, both statues are small, bronze, and near the ocean, and both are based on similar stories. Mei (May) Robin standing beside the Statue of Pania. was based on a piece owned by May’s own family. This is a good one Allan. 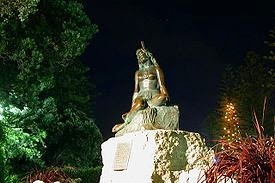 I've heard of the statue, even seen her when we visited Napier but never realised the story behind it. And getting that photo of the girl who posed for the face. That was amazing too. That's what I like about this blog. Although I have no interested in postage stamps, there is always something new to learn about my country, New Zealand. I must admit, I was a bit surprised at the story too. I was expecting it to be the story of the girl who swam to the man she loved but that is from Rotorua, not Napier. So that is one thing I'm enjoying too; learning more about New Zealand. Why don't you tell that story too Allan? I think the story of Hinemoa would be one of the best Maori love stories. There must be some stamps on it. A few years ago we attended a wedding on the island in the middle of Lake Rotorua. It was held near a hot thermal pool called Hinemoa's Pool. The story of Hinemoa is a lovely story. A love-story in the full sense and it ends well too. The girls agree to, so we will do that story soon. I have just finished reading your page on Himemoa and now found the link to this one. The story of Pania is a lot more tragic. You have handled it well, giving honour and respect to the stories of my people. Thank you for that. Personally I did not like the ending to this story. It would have been nice if somehow they could have got back together again. Now concerning your comments about how I did this post. I am glad of your approval. Its important to me that I handle your people's stories, your treasures we could say, with respect. We have a large and ever growing hit rate, about 60% are from other countries overseas, so in some ways, you could say, we are show casing New Zealand & New Zealand Maori to the world. I do not take that lightly. The part near the bottom where you told us of the two lessons you received from your friend. Can I borrow those words. They explain something I knew in my heart but been unable to say in pakeha words. Also I have met Mei (May) Whaitiri. She is a lovely lady. You would enjoy meeting her. I would like to meet Mei (May) Whaitiri one day. Now a question for you:- Do you feel it is possible that Pania of the ocean could have a child with Karitoki one of the land? I am sorry Allan. It was rude of me to ignore your comments in my rush to tell you I had met Mei. 60% of you hits from overseas! That is impressive. The need to showcase New Zealand including Maoridom is important I understand but I wonder if more people would be reached if we saw less of copied facts and more of you. Just something to ponder upon, Allan. With respect Allan, you disappointed me. Your question just above. There is your Pākehā thinking coming through. I thought we were getting somewhere, particularly on your Hinemoa page. Oh let approach this another way. Sit down somewhere quiet and relax. Clear you mind of all things, leave your logic and intelligence behind. Now pick up your story and read it with your heart. Without thinking about it, read it through again. What does your heart say? Do you want this to be true. If your heart wants it then it is true. I'll be online here tomorrow afternoon. Tell me how you go on. I'll be interested. You surprised me with that request. But tonight I tried it. I have an idea its like what we call fairy stories, we tell them to children. The children grasp them and believe in them, at the same time extracting lessons and morals. Once the child grows older comes the realisation that it was "just" a story, but inside the story, the message, the moral remains. Is this similar to Maori too? They hear and love these stories. Even when they are proved to be impossible, still the story and it moral lessons remain. Its power you might say. I believe comparing it with a children's fairy story simplifies it a bit but there is moral truth in most children s stories. One purpose here is to teach little children, a purpose that remains true for most mythology too. I think you explain it quite well in you story above. There is the truth in these stories. They are stories of the heart not the mind. I'm not sure you entirely have that yet but you are getting there. I thank you again for opening your eyes to the culture of my people.